Lowery Cruthers and Vivian Krill are seen watching a replay of the Indominus rex using her camouflage ability, to the surprise and confusion. Jurassic World CEO Simon Masrani comes up behind them, asking to see the video again. Staring intently at the screen, Masrani furrows his brow himself. After jumping from a waterfall, the brothers Zach and Gray Mitchell wring out their wet clothes. Gray reaches into his fanny pack, which Zach had previously dubbed a “dork pouch”, and takes out a small candy bar, handing half of it off to Zach. The two eat it, before a rumble of thunder urges them to press on. Coming out of the bush, the two stare out into an open plain, with a mountain range beyond it. The journey back to the Main Street seems daunting, but Zach speaks words of encouragement to Gray and then removes and discards his blue VIP wristband. While trekking through the jungle, Gray ponders aloud that had humans never gone extinct, that life would be similar to their current predicament: humans scared all the time. Zach reminds his little brother that humans would not have been around had dinosaurs never gone extinct. While Owen Grady and Claire Dearing are in the jungle, looking for Dearing’s nephews, Zach and Gray, Claire proposes launching a search grid for the boys, which Grady doesn’t respond to. However, she brings up that she regrets not seeing her nephews more, and Grady responds that human beings are messy, and nihilistically dubs the human race an overrated species. Dearing begins to realize she had been underestimating Grady’s abilities as a tracker/hunter, just as he begins to rub dinosaur spor over his forearms in an effort to hide his scent. Grady begins to assist Dearing in rubbing the feces on herself, when she decides she’s capable of doing it herself. Rubbing the poop on herself, she over does it, much to the disgust of Grady. The Indominus‘ thundering footsteps are heard as Grady and Dearing hide behind a large log. Suddenly, the faint roar of a helicopter is heard in the distance, attracting the rogue hybrid’s attention. As the sound of the footsteps fade away, Grady and Dearing look up from over the log, seeing the coast is clear. Dearing remarks the wanting of a tequila due to the stress she’s experiencing. Vic Hoskins and an unidentified InGen agent walk up to a helicopter on the helipad. The InGen employee says that they’re successfully rounding up most of the dinosaurs, but a few are giving them trouble. Hoskins reply is for them to try harder before boarding the helicopter. 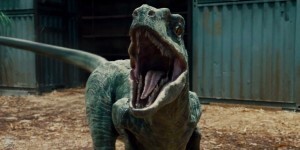 Outside the Velociraptor enclosure, Grady, in front of his Raptors, Echo, Blue, Delta and Charlie, sees Dearing come up to the cage bars. Dearing, in mock jealousy, points out he’s spending so much time with his Raptors. Smirking, Grady responds that they ‘get’ him, before frowning and remarking that Hoskin’s plan to take down the Indominus is not a good idea, especially if the weaponization of the Velociraptors is successful.